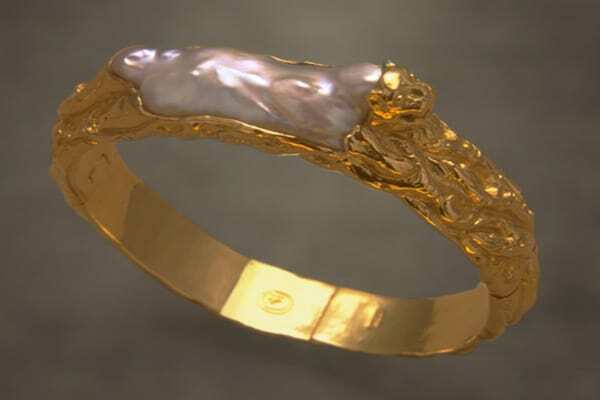 n this Pearl Bracelet, you can see that a large Baroque Pearl forms the main section of a running tiger. The tigers face and limbs are hand rendered by repoussé in 22 Karat Gold. This piece of fine art jewelry took 327 hours to complete in the Zoein Jewels workshop. Baroque Pearls often appear in fine art jewelry works because their irregular shapes frequently resemble other things, the tiger this pearl bracelet, or a ladies bust, the body of bird or an angle. While round pearls are more valuable and lend themselves to classic jewelry designs, Baroque Pearls are just the opposite and inspire jewelry that’s fashionably, free form and artistic. As symbol jewelry, the tiger pearl bracelet captures the fierce elegance of natures wildness. It’s a fashion statement that brings to mind the deepest jungles and Siberian slope. When wearing a pearl bracelet like this the attributes of the tiger are close at hand. A Tigers strength, speed and prowess have made it symbol of warriors and kings. Its strengths, reaches mythic proportions, and is the very reason why it is such a prized trophy. The Tiger Pearl Bracelet brings awareness to the plight of this beautiful animal, that’s nearly been hunted to extinction. Each part of the Tiger is infused with such power that even its bones are ground and eaten in order to ingest its strength. In days of old, without the aid of a firearm, the Tiger hunt, a true test of courage, would make a man out of a boy. The Tiger was the prey of India’s kings and world’s would-be heroes. Yet today it is but the target of greed stricken poachers. It is true that even the greatest work of art can be destroyed by ignorance. Each part of nature that we destroy becomes a lost part of ourselves. Can you imagine that this pearl bracelet with the significant of the tiger and the traditions that it’s a part of? In the venerable art of Feng Shui, the Tiger is the counter part of the Dragon and represents the direction of the west. The Tiger is also one of the twelve Signs of the Chinese Zodiac, and in legend is the feline mount of the Lord of Wealth and the guardian of his riches. The tiger within us is the fierceness that is called upon to protect. It’s the agility to evade harm and the courage to assert the truth of our own nature. In its nocturnal hunt the Tiger represents mans search for truth through the dark regions of the unconscious mind. The Tiger’s power to ward off malevolent and unfriendly spirits have made it a favorite power animal of indigenous shaman healers. Symbol jewelry is infused with an affinity to what it symbolizes. Because of the stunning breakthroughs in science we now know that influence can be transferred with out the need of a direct energetic link, as is exemplified by morphic fields. The tiger pearl bracelet is a timeless a tribute to the tiger.